Aeroelasticity is the branch of physics and engineering that studies the interactions between the inertial, elastic, and aerodynamic forces that occur when an elastic body is exposed to a fluid flow. Although historical studies have been focused on aeronautical applications, recent research has found applications in fields such as energy harvesting and understanding snoring. The study of aeroelasticity may be broadly classified into two fields: static aeroelasticity, which deals with the static or steady response of an elastic body to a fluid flow; and dynamic aeroelasticity, which deals with the body's dynamic (typically vibrational) response. Aeroelasticity draws on the study of fluid mechanics, solid mechanics, structural dynamics and dynamical systems. The synthesis of aeroelasticity with thermodynamics is known as aerothermoelasticity, and its synthesis with control theory is known as aeroservoelasticity. The second failure of Samuel Langley's prototype plane on the Potomac has been attributed to aeroelastic effects (specifically, torsional divergence). Problems with torsional divergence plagued aircraft in the First World War, and were solved largely by trial-and-error and ad-hoc stiffening of the wing. In 1926, Hans Reissner published a theory of wing divergence, leading to much further theoretical research on the subject. In the development of aeronautical engineering at Caltech, Theodore von Kármán started a course "Elasticity applied to Aeronautics". After teaching the course for one term, Kármán passed it over to Ernest Edwin Sechler, who developed aeroelasticity in that course, and in publication of textbooks on the subject. In 1947, Arthur Roderick Collar defined aeroelasticity as "the study of the mutual interaction that takes place within the triangle of the inertial, elastic, and aerodynamic forces acting on structural members exposed to an airstream, and the influence of this study on design." In an aeroplane, two significant static aeroelastic effects may occur. Divergence is a phenomenon in which the elastic twist of the wing suddenly becomes theoretically infinite, typically causing the wing to fail spectacularly. Control reversal is a phenomenon occurring only in wings with ailerons or other control surfaces, in which these control surfaces reverse their usual functionality (e.g., the rolling direction associated with a given aileron moment is reversed). As can be seen, for λL = π/2 + nπ, with arbitrary integer number n, tan(λL) is infinite. n = 0 corresponds to the point of torsional divergence. For given structural parameters, this will correspond to a single value of free-stream velocity U. This is the torsional divergence speed. Note that for some special boundary conditions that may be implemented in a wind tunnel test of an airfoil (e.g., a torsional restraint positioned forward of the aerodynamic center) it is possible to eliminate the phenomenon of divergence altogether. Control surface reversal is the loss (or reversal) of the expected response of a control surface, due to deformation of the main lifting surface. For simple models (e.g. single aileron on an Euler-Bernoulli beam), control reversal speeds can be derived analytically as for torsional divergence. Control reversal can be used to aerodynamic advantage, and forms part of the Kaman servo-flap rotor design. Flutter is a dynamic instability of an elastic structure in a fluid flow, caused by positive feedback between the body's deflection and the force exerted by the fluid flow. In a linear system, 'flutter point' is the point at which the structure is undergoing simple harmonic motion—zero net damping—and so any further decrease in net damping will result in a self-oscillation and eventual failure. 'Net damping' can be understood as the sum of the structure's natural positive damping, and the negative damping of the aerodynamic force. Flutter can be classified into two types: hard flutter, in which the net damping decreases very suddenly, very close to the flutter point; and soft flutter, in which the net damping decreases gradually. Methods of predicting flutter in linear structures include the p-method, the k-method and the p-k method. In water the mass ratio of the pitch inertia of the foil vs that of the circumscribing cylinder of fluid is generally too low for binary flutter to occur, as shown by explicit solution of the simplest pitch and heave flutter stability determinant. For nonlinear systems, flutter is usually interpreted as a limit cycle oscillation (LCO), and methods from the study of dynamical systems can be used to determine the speed at which flutter will occur. Structures exposed to aerodynamic forces—including wings and aerofoils, but also chimneys and bridges—are designed carefully within known parameters to avoid flutter. In complex structures where both the aerodynamics and the mechanical properties of the structure are not fully understood, flutter can be discounted only through detailed testing. Even changing the mass distribution of an aircraft or the stiffness of one component can induce flutter in an apparently unrelated aerodynamic component. At its mildest this can appear as a "buzz" in the aircraft structure, but at its most violent it can develop uncontrollably with great speed and cause serious damage to or lead to the destruction of the aircraft, as in Braniff Flight 542. 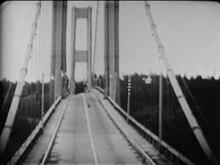 Famously the original Tacoma Narrows Bridge was destroyed as a result of aeroelastic fluttering. In some cases, automatic control systems have been demonstrated to help prevent or limit flutter-related structural vibration. Flutter as a controlled aerodynamic instability phenomenon is used intentionally and positively in windmills for generating electricity and in other works like making musical tones on ground-mounted devices, as well as on musical kites. Flutter is not always a destructive force; recent progress has been made in windmills for underserved communities in developing countries, designed specifically to take advantage of this effect. The oscillating motion allows variable-stroke waterpumping to match the variable power in the wind. Semirotary binary flutter can also have an upper critical airspeed at which it stops, affording automatic high wind protection The resulting Wing'd Pump has been designed to mount on the well it pumps or float on the pond it draws from. At its large scale the flutter is coupled by static gravity imbalance as well as dynamic imbalance. Further a gravity pendulum achieves large amplitude elasticity most practically. The same annual output can be achieved with wing length equal to a multiblade rotary windpump's diameter, in half the windspeed regime. P. Sharp and J. Hare showed a toy linear generator run by two flutter wings. The word flutter is typically linked to the form of aerodynamic instability discussed above. Though, a connection between dry friction and flutter instability in a simple mechanical system has been discovered, watch the movie for more details. Buffeting is a high-frequency instability, caused by airflow separation or shock wave oscillations from one object striking another. It is caused by a sudden impulse of load increasing. It is a random forced vibration. Generally it affects the tail unit of the aircraft structure due to air flow downstream of the wing. Flow is highly non-linear in the transonic regime, dominated by moving shock waves. It is mission-critical for aircraft that fly through transonic Mach numbers. The role of shock waves was first analyzed by Holt Ashley. A phenomenon that impacts stability of aircraft known as 'transonic dip', in which the flutter speed can get close to flight speed, was reported in May 1976 by Farmer and Hanson of the Langley Research Center. Aeroelasticity involves not just the external aerodynamic loads and the way they change but also the structural, damping and mass characteristics of the aircraft. Prediction involves making a mathematical model of the aircraft as a series of masses connected by springs and dampers which are tuned to represent the dynamic characteristics of the aircraft structure. The model also includes details of applied aerodynamic forces and how they vary. The model can be used to predict the flutter margin and, if necessary, test fixes to potential problems. Small carefully chosen changes to mass distribution and local structural stiffness can be very effective in solving aeroelastic problems. These videos detail the Active Aeroelastic Wing two-phase NASA-Air Force flight research program to investigate the potential of aerodynamically twisting flexible wings to improve maneuverability of high-performance aircraft at transonic and supersonic speeds, with traditional control surfaces such as ailerons and leading-edge flaps used to induce the twist. ^ Sousa, V. C. (2011). "Enhanced aeroelastic energy harvesting by exploiting combined nonlinearities: theory and experiment". Smart Materials and Structures. 20 (9). ^ Ellis, P. D. M. (1994). "Laser palatoplasty for snoring due to palatal flutter: a further report". Clinical Otolaryngology. 19 (4). ^ Collar, A. R. (1978). "The first fifty years of aeroelasticity". Aerospace. 2. 5: 12–20. ^ a b "Binary Flutter as an Oscillating Windmill - Scaling & Linear Analysis". Wind Engineering. 37. 2013. Archived from the original on 2014-10-29. ^ Tang, D. M. (2004). "Effects of geometric structural nonlinearity on flutter and limit cycle oscillations of high-aspect-ratio wings". Smart Materials and Structures. 19. ^ "Visual demonstration of flutter which destroys an RC aircraft", YouTube (Video) . ^ "Control of Aeroelastic Response: Taming the Threats" (pdf). ^ "WING'D MILLS 2013: FLO'Pump and FLUTTER WELL Pump" (video). ^ "The Flutterwing WindPumps: Design, NonLinearities, & Measurements". Wind Engineering. 38. 2014. Archived from the original on 2014-06-08. ^ Wing'd Pump, Canada: Econologica . ^ FlutterMill, UK: Creative Science . ^ Bigoni, D.; Noselli, G. (2011). "Experimental evidence of flutter and divergence instabilities induced by dry friction". Journal of the Mechanics and Physics of Solids. 59 (10): 2208–2226. Bibcode:2011JMPSo..59.2208B. doi:10.1016/j.jmps.2011.05.007. ^ Golestani, A. (2014). "An experimental study of buffet detection on supercritical airfoils in transonic regime". Proceedings of the Institution of Mechanical Engineers, Part G: Journal of Aerospace Engineering. ^ Holt Ashley. "Role of Shocks in the "Sub-Transonic" Flutter Phenomenon", Journal of Aircraft, Vol. 17, No. 3 (1980), pp. 187-197. Wright, J. R. and Cooper, J. E., Introduction to Aircraft Aeroelasticity and Loads, Wiley 2007, ISBN 978-0-470-85840-0. Hoque, M. E., "Active Flutter Control", LAP Lambert Academic Publishing, Germany, 2010, ISBN 978-3-8383-6851-1. Garrick, I. E. and Reed W. H., "Historical development of aircraft flutter," Journal of Aircraft, vol. 18, pp. 897–912, Nov. 1981. Patrick R. Veillette (Aug 23, 2018). "Low-Speed Buffet: High-Altitude, Transonic Training Weakness Continues". Business & Commercial Aviation. Aviation Week Network.